There was another good story published in The Age yesterday as part of the continuing series, Project Melbourne: Towards a Sustainable City. Titled The Great Divide, it compares living in a CBD apartment with outer suburban living. However there is a point where the writer, Julie Szego, goes too far. She contends that outer suburban living “depends on jobs becoming a reality. If jobs don’t come to the suburbs, roads will remain choked and families time-poor”. The idea that there are few jobs in the suburbs is a common misconception with important policy implications. The reality is that around 72% of all jobs in Melbourne are located at a distance greater than 5 km from the CBD. Half of all jobs are more than 13 km from the CBD. And these aren’t all low-skill, low-pay jobs either. The majority of jobs in Melbourne occupied by graduates are located more than 5 km from the CBD. This misunderstanding of the geography of employment is also displayed in the first feature written for The Age’s current Project Melbourne series. That article, titled The Outer Limits, made the claim that “of those jobs that are available (in fringe suburbs), a higher percentage are blue-collar”. The idea that suburban jobs are mostly in low skill occupations seems to be another popular misconception. In fact, only 9% of jobs located more than 40 km from the CBD are in the Manufacturing sector, compared to 14% for all of Melbourne. If the definition of blue collar is extended to include jobs in the Wholesale, Transport and Construction sectors, the respective figures for the fringe and metropolitan area are 26% and 31%. What the fringe areas actually do have is a higher proportion of jobs than the metropolitan average in the high-skill education and health sectors. It is not in any event clear why having more ‘blue collar’ jobs would be a disadvantage compared, say, to having an over-representation of retailing jobs. Many jobs in the modern Manufacturing and Construction industries are highly skilled and involve interacting with complex technologies and systems. The main issues associated with employment in Melbourne can be explored in this presentation I gave last year at a cultural industries seminar at Qld University of Technology, Jobs in the Suburbs. The contention in Julie Szego’s article that outer suburban roads are “choked” probably depends on one’s definition of what constitutes congestion. Most outer suburban residents travel locally – for example, 70% of trips by residents of the City of Casey are to destinations located in either Casey itself or the adjacent City of Cardinia (the corresponding figure for Cardinia is 83%). As the accompanying graphic shows, this also holds for work trips (although commuting only makes up about a fifth of all trips by Melburnians). 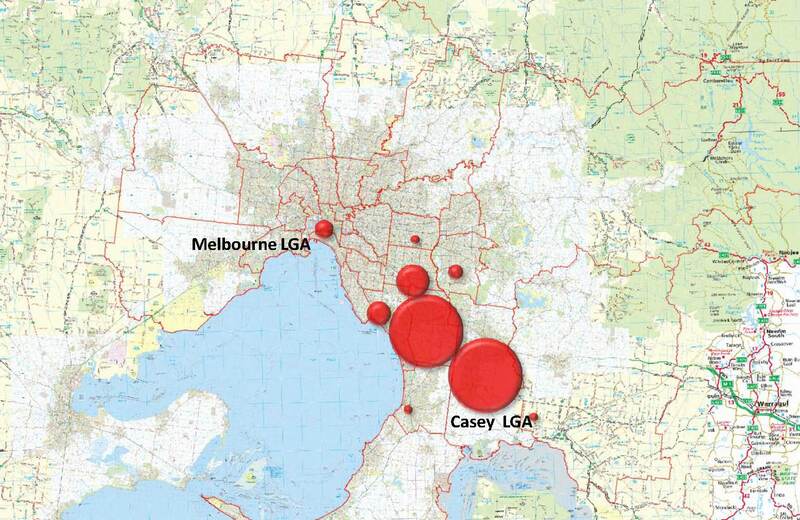 Around half of the work trips made by residents of Casey terminate within either Casey itself or Cardinia. Very few involve commuting to the inner city where congestion really is serious. One of the key reasons why outer suburban residents travel greater distances than people living in less distant suburbs is precisely because roads in the outer suburbs, including freeways, tend to be relatively uncongested. As for the charge that outer suburban families are ‘time poor’ because of their location, this also doesn’t stand up to closer scrutiny. Average cumulative daily travel times are pretty much the same across the whole city. If anything, residents of outer suburbs travel for less time in total than residents in the middle suburbs and inner city. They do however travel further in the same time because they can – as noted above, roads are less busy in the outer suburbs, giving higher average speeds. The stereotype of the outer suburban commuter travelling long hours by train to and from the city is also a myth – only 5% of Casey residents work in the CBD (although they mostly use the train). Families in the outer suburbs who are ‘time poor’ suffer for much the same reasons that families anywhere do – two parents working, kids involved in numerous post-school activities, responsibilities to ageing parents, and so on. It has much less to do with where you live than with your economic and demographic circumstances. While it is important to dispel these sorts of false stereotypes, I think Julie Szego and The Age have done an outstanding job with this feature. It is too easy to ignore how difficult it is for a journalist, who must be able to move quickly from discipline to discipline, to pull together a coherent story on complex issues in a tight timeframe.